Current Texas Horse Judging Cup rankings based on the 28 contests held between 6/8/17 and 4/13/2019. We COMBINE the results for 4H and FFA at San Antonio. Rankings used for the Texas Horse Cup are what they would be at the contest if both groups competed with each other. Because of the relatively unique nature of the Houston horse judging contest it has been handled differently. The points for Houston 4H teams are based on the 'combined' results for 4H and FFA. The results for Houston FFA teams are based solely on the FFA results. Email jeff@livestockjudging.com if you have any questions. 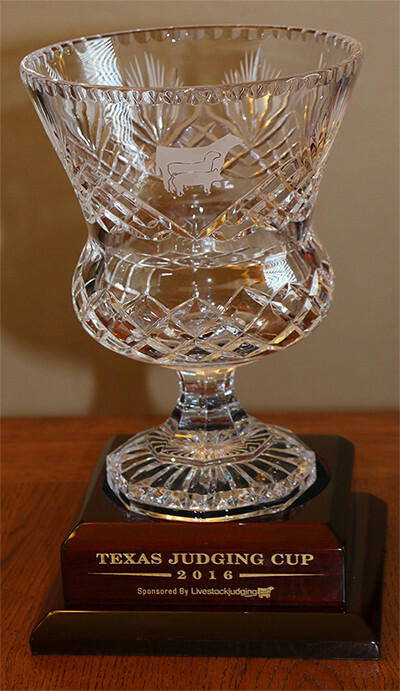 Points for the 2018 Texas Horse Cup are earned between the Texas 4H Invitational in 2017 and the end of the Texas 4-H state judging contest in 2018. The Texas FFA and 4-H state contests will each count for 500 points.